Services are scheduled for 9:30 a.m. Wednesday, Sept. 7, at Our Lady of Grace Catholic Church for Jacinto V. Arredondo of Artesia. Arredondo, 81, passed away Friday, Sept. 2, 2016, at Covenant Medical Center in Lubbock, Texas. Fr. Martin Cornejo will officiate at the services, with interment to follow at Woodbine Cemetery. Pallbearers will be Lino Arredondo, Julio Arredondo, David Madrid, Sergio Puentes, Faustino Pizarro, Alejandro Moncayo, Enrique Moncayo and Jacinto Arredondo Jr.
Jacinto was born Sept. 11, 1934, in San Bernardo, Durango, Mexico, to Miguel and Santos (Vega) Arredondo. On March 2, 1953, he married Maria Orquiz in Mexico. The couple came to Artesia on Feb. 2, 1980, and has resided here since. Jacinto worked as a derrick hand for Mack Chase. He was a member of Our Lady of Grace Catholic Church and enjoyed deer hunting and gardening. His passion was his family and grandchildren. 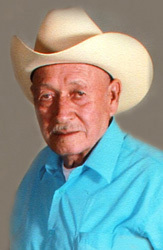 Survivors include his wife, Maria, of the family home; daughters Lydia Moncayo and husband Rito of Dalton, Ga., and Christina Pizarro, Ramona Arredondo, and Fernanda Arredondo and husband Estevan Grado, all of Artesia; son Jacinto Arredondo Jr. and Marisela Olivas of Artesia; sisters Norberta Pizarro and Gregoria Moreno, both of Durango, Mexico, Germana Gallegos of Chaparral, and Manuela Gaytan of Vado; brothers Hilario Arredondo of Anthony, Eulojio Arredondo and Francisco Arredondo, both of Juarez, Mexico, Aurelio Arredondo of Vado, and Reyes Arredondo of Oklahoma City, Okla.; 27 grandchildren; and 29 great-grandchildren. He was preceded in death by his parents; sons Audencio, Lino, Julio, Ernesto and Jose Arredondo; daughter Rosa Maria Arredondo; one brother; and one sister.